We, Students for Justice in Palestine, as well as countless individuals from across the California Community College system, have banded together from all walks of life. We are a diverse coalition that consist of all people of every color, nationality, religion, etc. Despite these differences, what brings us together is our common human identity. That’s why we are greatly concerned about the human rights abuses in Palestine, and the thought that our college system could be complicit in such gross violations is unbearable. For almost half a century, the Palestinian territories have been brutally occupied, which eventually resulted in the subjugation of millions of people, constructed on racial superiority and an illegal colonial network. The occupation, as documented by numerous human rights groups and multinational entities, results in some of the most horrid conditions. Conditions such as, but not limited to: water deprivation, segregation, racially-based legal systems, systematic home demolitions, and the restrictions against the freedom of movement, have resulted in one of the worst cases of systematic oppression gone largely unchecked. This system of abuse, as documented by many reputable organizations, including the United Nations, directly parallels the former South African system of Apartheid. This unjust system of human rights abuses has created an urgency amongst students throughout the community college system to take action in order to hold the Board of Governors accountable for any investments that profit from these abuses. As a result, we, the students of the California Community College system, call upon the Student Senate for California Community Colleges (SSCCC) to stand in solidarity with other California and National Universities by passing a resolution to divest from companies that profit from human rights abuses in Palestine. It is imperative that the college system examine it’s financial holdings to be certain that students aren’t paying their tuition dollars that in turn, is invested into certain companies that directly profit from the abuses in Palestine. Companies such as RE/MAX directly profit from the selling of segregated housing, and these housing units are illegal under international law. Others, such as Veolia, also profit from segregated systems such as roads and bus-lines. Lastly, companies such as Caterpillar Inc. profit from the systematic and discriminatory bulldozing of Palestinian homes, rendering thousands homeless. As students of the community college system, we have an obligation to stand for justice and make a difference. The issues of the world are our issues, for we are the future leaders of the free world and retain a common human element that’s unlimited. Divestment from companies that profit from human rights abuses is nothing new. It is directly modeled after divestment from companies that profited from apartheid in South Africa, where Blacks fell victim to a system of colonialism, segregation, and White supremacy. Back then, millions of students in the State and across the Nation stood up and deplored investments in companies that profited from such a system. Now, students are rallying once again to ensure that our colleges are not invested into companies that are once again profiting from human rights abuses. We urge that the SSCCC, that has the privilege of representing all 112 of California’s community colleges, to stand on the right side of history by urging divestment from companies that profit from human rights abuses in Palestine—in which our tuition dollars is invested, and to send a message that human rights abuses are unacceptable no matter where they may be. Yet SR #9, deemed too “political” for the ASUCD to vote on, is similar to past resolutions including the call to divest from Apartheid South Africa and Sudan. Thus this court ruling was highly selective and politically biased in targeting only divestment from Israel. It also suggests that the welfare of UC Davis students who are Palestinian and their families who are displaced from Israel or targeted by Israeli violence and restrictions on freedom of movement, freedom to education, and freedom to live does not matter. Palestinian Lives Matter! The verdict attempts to silence not only pro-Palestine activists on campus who are personally affected by UC Davis’s complicity with Israeli occupation and apartheid, but also future student activists who organize grassroots movements and participate in ASUCD’s democratic process. It is a tactic of campus ‘lawfare’ similar to that used by national Zionist groups to undermine the BDS movement. 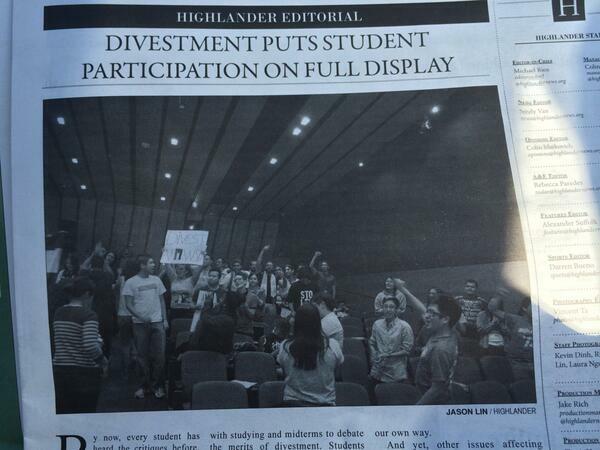 But this procedural maneuver cannot change the clear student consensus in favor of divestment for human rights. Students for Justice in Palestine considers this court ruling invalid because it would infringe on free speech rights to disallow “political” statements and because the ruling attempts to override the democratic process that operates in ASUCD. This discriminatory and repressive verdict will not be accepted by the SJP community, and there will be an organized response to this injustice. The fact is that the divestment movement has won at UC Davis, and we and the Palestinian rights movement stand by this victory. STANFORD, Calif. – The Undergraduate Senate of Stanford University just voted on a resolution to divest from the occupation of the Palestinian Territories. The resolution, entitled A Resolution to Divest from Companies Violating Human Rights in Occupied Palestine, called on the University to divest from multinational corporations facilitating human rights violations in the Occupied Palestinian territories. The vote followed a four-hour long Senate hearing and ended with 9 senators voting yes, 5 voting no, and one abstention. The resolution focused on multinational corporations and identifies multiple actors as being complicit in the violations against Palestinians living under occupation, including the governments of Israel, Egypt, Hamas, and the Palestinian Authority. The resolution stated that the Undergraduate Senate is not connected to the Boycott, Divestment, and Sanctions (BDS) movement. The resolution affirmed both Israelis and Palestinians’ rights to life, safety, and self-determination. Maintaining the illegal infrastructure of the Israeli occupation, in particular settlements and separation wall. Facilitating Israel and Egypt’s collective punishment of Palestinian civilians. Facilitating state repression against Palestinians by Israeli, Egyptian or Palestinian Authority security forces. Stanford Out of Occupied Palestine came together in pursuit of selective divestment as an effective response to the call from Palestinian society for university students to exert pressure for an end to the violations of their basic human rights. Over the course of six weeks SOOP’s campaign gathered immense student support; over 1600 students signed SOOP’s petition and about 400 supporters gathered at Tuesday’s hearing. Student organizers point to the growing number of student associations that have chosen to take a step towards ending their institutions’ complicity in the violation of Palestinian human rights. On Sunday, the University of California Student Association System voted in favor of two divestment resolutions calling for an end to the system’s investments in Palestinian suffering. 6th UC to officially pass divestment, 7th campus to hold a majority vote. 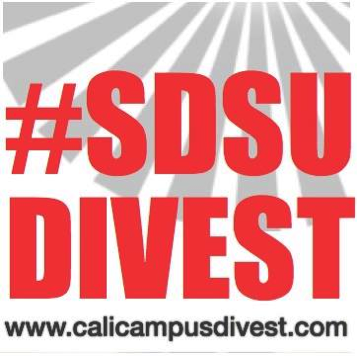 Davis joins UCLA, UC Riverside, UC Berkeley, UC San Diego, and UC Irvine as officially supporting divestment. “At tonight’s (Jan. 29) ASUCD senate meeting, Senate Resolution (SR) #9 passed with an 8-2-2 vote. The text of SR #9 calls for the University of California (UC) Board of Regents to divest from “corporations that aid in the Israeli occupation of Palestine and illegal settlements in Palestinian territories, violating both international humanitarian law and international human rights.” ASUCD voted down a similar resolution this past May. With the passing vote, ASUCD formally recommends the UC Regents to divest from American companies Caterpillar Inc., G4S PLC, Veolia Environment and Raytheon. Over 550 UC Davis students, staff and faculty members attended the senate meeting, which was called to order at 8:57 p.m. in the Sciences Lecture Hall 123.” Read more at The Aggie. the US government to end military aid to Israel. 52 % of voting members also pledged not to “take part in any research, conferences, events, exchange programs, or other activities that are sponsored by Israeli universities complicit in the occupation of Palestine and the settler-colonial policies of the state of Israel” until such time as these universities take steps to end complicity with dispossession, occupation, and apartheid. SJP West is writing to voice serious concerns about the recent developments surrounding the student-regent designate, Avi Oved, and the possibility that he accepted a financial contribution from Adam Milstein during his political campaign in 2013. While Students for Justice in Palestine is an organization with views on Israel/Palestine and divestment that are at odds with those of Oved and his party slate, the issue at hand is not divestment, but the potential violation of transparency and ethicality so integral for a student representative to uphold. The evidence presented to date suggests that a student who will potentially be tasked with representing the entire University of California student body willfully undermined the democratic process by seeking outside funding from an individual with a partisan political agenda. This is profoundly troubling because it sends the message that student political favors are for sale and that the general student body’s needs may be of secondary importance to the desires of such off-campus political donors. Despite political differences, all students should be able to know that our representatives are only answerable to student concerns and not those of outside entities. Student representatives must be solely accountable to their constituents. It is absolutely essential for these charges to be thoroughly ruled out: how can we hold state and federal leaders to account if we cannot even do the same for our own student leaders? We need to be absolutely certain that the student regent designate’s loyalties lie with UC students first and foremost and not with outside organizations. Furthermore, we find Milstein’s public displays of racist and Islamophobic sentiment repugnant, and Avi Oved’s potential solicitation of funds from such a donor to be a matter of grave concern. Representing the UC’s diverse student body requires a student regent with a demonstrated commitment to openness and tolerance. Avi Oved’s refusal to distance himself publicly from this exchange suggests an incompatibility with these qualities. Even excluding the substantive content of Mr. Milstein’s beliefs, the possibility that the integrity of student government is being undermined by outside forces to further a particular political agenda is unacceptable and must be investigated thoroughly. Finally, it is very alarming that Oved refused, for no apparent reason, to join the UCSA’s conference call specifically held for him to answer questions and be accountable to his constituents. In addition to this, his lack of explicit denial of accepting those contributions from Milstein and of the email’s authenticity are also disturbingly telling. Both participation in a conversation about these allegations and an assurance that the contributions did not take place would have been crucial to preserving student trust in their student regent-designate. An investigation is hence paramount to ensure that Oved is the right candidate for this position and that students can trust him to represent them fairly and transparently. We hope that these allegations will be investigated in as scrupulous a manner as possible. The credibility of our student representation may very well depend on it. On Wednesday, January 29, 2014, AMCHA Initiative, StandWithUs, and company took the opportunity to delegitimize the Boycott, Divestment, and Sanction (BDS) movement, as well as defame California State University, Northridge (CSUN) Professor David Klein at a CSU Board of Trustees meeting. AMCHA has claimed that he “has inappropriately used university resources on several occasions, including posting anti-Semitic pictures and text on a webpage hosted by CSUN and by using CSUN email for political campaign activity.” (1) Although a letter written by lawyers, Jim Lafferty and Liz Jackson, in September of 2013 provides ample support and clarification that Klein did not violate any CSU policies and was cleared of complaints by the CSUN administration as well as the California Attorney General (2), AMCHA continues the witch-hunt on BDS supporters, such as Klein. Thanks to mobilization by Jewish Voice for Peace – Los Angeles (JVP – LA), Palestine activists banded together within a matter of a few days to stand up for academic freedom, the BDS movement, and human rights at the CSU Board of Trustees meeting. Representatives from JVP – LA and Students for Justice in Palestine – West (SJP – West), current and former CSU students, and CSU faculty were present to show solidarity with Palestinian civil society’s call for BDS and to protect Professor David Klein’s right to freedom of speech. Students for Justice in Palestine-West would like to thank you for your time today as we urge you to foster an environment tolerant of all speech, including the advocacy of Palestinian rights as well as the boycott of and divestment from corporations that are complicit in Israel’s violations of human rights and international law. Like the students who fought for the boycott of the apartheid regime in South Africa, we are a non-violent movement driven solely by a fundamental belief in universal human rights and their interconnected and unconditional nature. As an academic institution, the CSU system has a responsibility to recognize and protect the right to education everywhere. In Palestine, access to education is impeded by the brutality of Israeli settlers and soldiers, military checkpoints and the wall, segregated academic institutions, as well as the denial of entry for international academics. As American students, we are deeply concerned for the wellbeing of our Palestinian counterparts. Boycott and Divestment is a means to ensure that all inhabitants of the region, regardless of their religion and ethnicity, live in an equal democratic society. We applaud American academics who have used their freedom of expression to voice their concerns about the violation of Palestinian human rights, even in the face of coercion and threats. Along with SJP – West’s statement, 6 others publicly voiced support for academic boycott and freedom, whereas 3 people tried to silence and criminalize that support. A few days after the CSU Board of Trustees meeting, on Friday, January 31, 2014, CSU Chancellor Tim White issued a statement on behalf of the entire CSU system denouncing Asian American Studies Association, American Studies Association, and Native American Studies Association resolutions endorsing the 2005 call by Palestinian civil society to academically boycott Israel, which is currently being challenged by CSU faculty via petition. To paraphrase, according to Chancellor White’s proclamation, academic freedom is important, but what he chooses to ignore are academic restrictions/limitations placed upon Palestinians living under occupation, within and outside of the borders of Israel. Because of these restrictions/limitations, Palestinians are not granted the academic freedom that Chancellor White expresses is part of the “basic tenets of higher education.” Also, contrary to White’s beliefs, an academic boycott of Israel would pressure the state to give equal and just access to education for everyone, which would further academic freedom rather than hinder it. 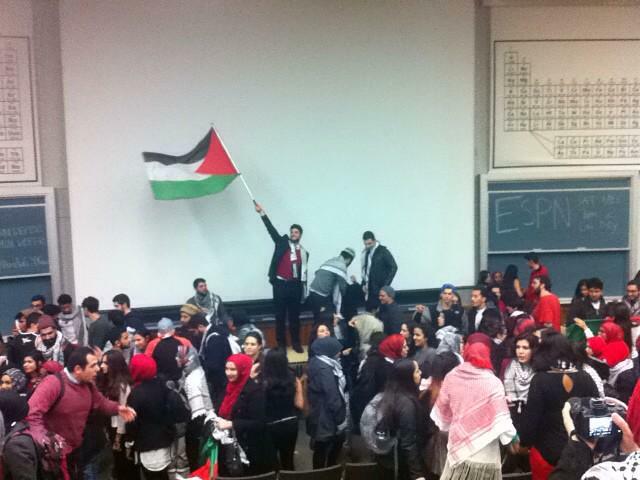 Despite much effort to stifle critical discussions and actions in relation to Israel by administrators and external organizations, students and faculty continue to push against the current by initiating BDS campaigns and developing Palestine activism on campuses within California (and beyond). There is no doubt that the BDS movement is growing, is being noticed, and it will not be stopped.